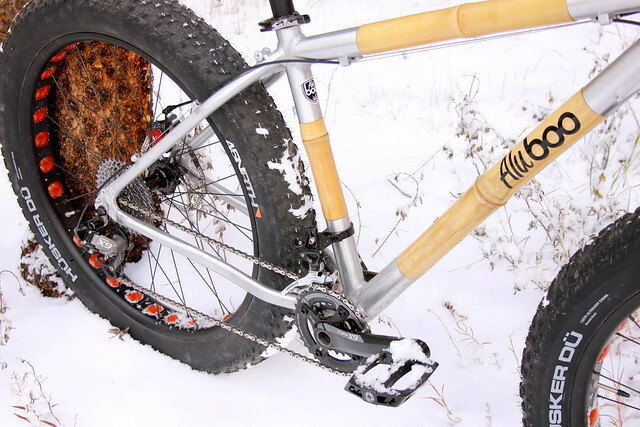 Meet the AluBooyah: the world’s first aluminum and bamboo fat bike! In Colorado the first snow has fallen on the front range and though it is barely yet October, people’s thoughts are turning towards the end of fall and beginning of winter when snow blankets the ground and normal bikes just don’t give you the freedom they did in the other three seasons. Though cyclocross may be all the rage in these fall months, hearty winter explorers know that Fat Bike season is fast approaching. Originally built with winter exploration in mind, fat bikes have gained a much wider following as mountain bikers see their utility for beaches and sandy trails and the fun they can offer with increased traction on any terrain. 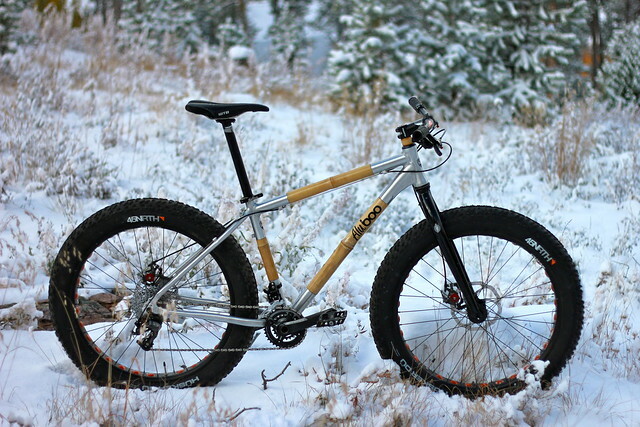 And now, after building a number of custom bamboo-carbon fat bikes, Boo Bicycles is applying their experience by expanding their AluBoo line to include a production fat bike frameset – the AluBooyah. Why does the AluBooya capture people’s interests so? Maybe it’s the stark beauty of bamboo tubes and brushed aluminum, or the novelty of having a frame built half from natural bamboo stalks that help absorb vibration better than even carbon fiber. But industry people and fat bike enthusiasts were also struck by the thoughtful design of the AluBooyah. By virtue of its young age and still-developing status, the fat bike market is characterized not by standards but by a plethora of different options for frame and fork spacing, bottom bracket width, and head tube taper. Rather than offering all the options available, the engineers and cycling fanatics behind the AluBooyah have taken a long, hard look at the fat bike market and selected the options that make the best frame and give customers the most options for building up their new fat bike. Up front, the AluBooyah has a custom designed aluminum fork with a 1.125 – 1.5” tapered steerer tube built to deal with all the stresses that fat wheels and loads of traction put on the front end of the bike. The fork also has three bottle bosses on each leg to allow customers to attach bottle cages or panniers to their hearts’ content. Stiffness is also prioritized by selecting older and larger diameter bamboo stalks for the down tube, top tube, and seat tube than are used for other Boo and AluBoo models. The bottom bracket uses a Press Fit 121 design that facilitates smooth welds and allows the frame to accommodate wheel setups as wide as a 4.8″ tire on a 100mm Clown Shoe rim. Rear hub spacing is 170mm and symmetrical, which offers customers more wheel options than any other width. When combined, these features have helped to create a lively yet durable frame that has stood up to “countless drop-offs and trips around pump tracks… basically anything that could break a frame,” according to Boo and AluBoo co-founder Nick Frey. Did you read something that caught your eye? Think you might have been bitten by the fat bike bug? If so, AluBoo is now accepting deposits for its first production run of AluBooyahs, which will become available in early December. Final pricing is still being set, but a frame, fork, and headset will run under $1,000. If you want to build up a full bike, we can help you there too. Framesets come standard with a brushed aluminum finish, but if you desire something a little brighter, custom paint jobs are available starting at $245. If you are interested, act fast! We only have enough bamboo for 150 frames this winter. Want to see more pictures? Take a glance at our gallery where the AluBooyah resides in its natural snowy habitat.